But critics note that as lawmakers debate legislation this spring to raise a state-imposed cap on the number of charter school seats in Boston and other cities, they will do so without a full picture of demand. “If a family is applying to charter schools, they are applying to all of them,” said Susan Trotz, a guidance counselor at the city-run Curley K-8 School in Jamaica Plain, whose 200 eighth-graders each year often apply to 20 traditional, charter, or private high schools. Charter school advocates concede that the tallies for the state and communities like Boston include duplication, but doubt it is occurring at a rate that would give a false sense of demand. The total number on the waiting lists has doubled over the past three years, an unprecedented rate. “It’s an argument that doesn’t hold water,” said Kevin Andrews, headmaster at Neighborhood House Charter School in Dorchester. Andrews said waiting lists at many Boston charter schools have grown over the last few years, a reliable sign, he said, that more students are seeking out their schools. At Neighborhood House the waiting list, which carries over each year, has spiked to 3,760 students for next fall, after spending years hovering around 2,000, according to state numbers. “It’s a movement that has caught fire,” Andrews said. Charter schools also have stepped up recruitment efforts, gaining access to student addresses from local districts. 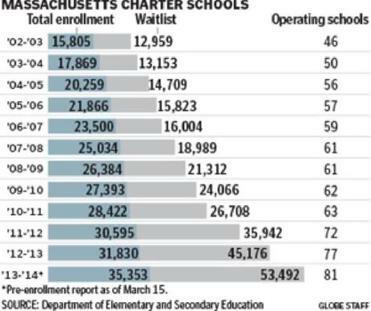 The waiting lists have been a political football for years in Massachusetts, which limits the number of charter schools that can open. When charter school leaders and advocates launch a campaign to raise the cap, they frequently cite the growing number of students on the lists as evidence of pent-up demand. And for families on waiting lists, the predicament can be discouraging. Karla Walker of Mattapan said she has been trying to get her son into a charter school for more than two years. She initially applied to the Edward Brooke Charter School in Roslindale, but her son landed far down on the waiting list. This year, she tried Conservatory Lab Charter School in Brighton with no luck. “It’s frustrating to think he might not have that opportunity to attend a charter school,” said Walker, who likes the longer days, high expectations, and strict discipline at charter schools. Created under the 1993 Education Reform Act, charter schools are designed to provide innovative educational alternatives to traditional public schools. They operate with fewer restrictions from the state, most often are independent from local school districts, and almost always employ nonunion teachers. Many charter schools have among the best state standardized test scores, but state officials have closed some because of poor performance. Their growth is restricted to appease local school districts and teacher unions, which say charter schools unfairly divert funds from traditional public schools, even though they are left with fewer students to educate. A few years ago, Governor Deval Patrick, Boston Mayor Thomas M. Menino, other elected officials and advocates — motivated by the growing wait lists and charter school results — successfully pushed for a 2010 law that called for the doubling of charter school seats in Boston and other school districts with the lowest state standardized test scores. That effort helped fuel the opening of 18 new schools, and along with them more waiting lists. But even then, debate swirled around the accuracy of the waiting list tallies. Consequently, the 2010 law instructed charter schools each year to send to the state education department the names, addresses, and grade levels of the students on their waiting lists. The intent was for the state to weed out duplicates and create an accurate count. But the department never executed that statutory provision. State education officials said budget and staffing constraints have prevented them from devising a new way of tallying waiting lists. But they hope to have one in place next year. Richard Stutman, president of the Boston Teachers Union, chided charter school officials last week in his weekly e-mail bulletin for using waiting list tallies to justify an expansion. “It does a disservice to public discourse and knowledge to be fed a steady stream of inaccurate numbers to prove their point,” he said in an interview. At least one Boston charter school is seeking a more precise calculation of demand. The Brooke Charter School has opened two additional schools under the 2010 expansion law, and each school must keep separate lists, which range between 1,007 and 2,537 students, according to state figures. Jon Clark, Brooke’s codirector, said he knows duplication exists — his two children are on lists for all three campuses — but doubts that it is widespread. “We’re just curious about how many duplicates there are,” he said.